Cargo bike party outside Velo Star Cafe! 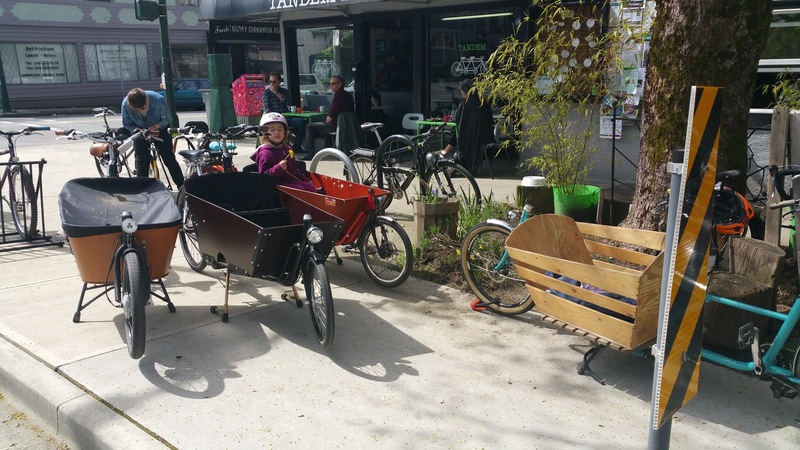 If you're looking to buy a cargo bike in Vancouver, the options are getting bettter & better. But, there's no one stop shop to test ride different brands. Quite a few brands of cargo bike, like our Bakfiets, aren't even sold here in brick & mortar stores--your only option is buying online. Until we get a great family & cargo biking shop (like Seattle's G&O Cyclery) here in Vancouver, you'll have to pound the pavement a bit. In the interests of making that easier for you, I've updated my list of bike shops that sell cargo bikes here in Vancouver. There are a few disappearances from my previous list--Grin Technologies has stopped carrying complete cargo bikes & is focussing on adding electric assist, or regular e-bikes. Dandy Lion Cargo has also stopped selling Bullitts, & Phil from Metrofiets has stopped building his gorgeous long johns. Their Surrey location has Pedego cargo bikes on the floor to test ride as well. Read about the daily school dropoff run on an electric Pedego Stretch by Lee-Anne Ekland on Mom Pardigm. Dream focuses on custom bikes, but they do sell Surly longtails--they usually don't have a floor model, so give them a call if you're hoping for a test ride. Mac Talla has no floor models available for test rides, you can order Babboe through them. Ed generally has both bikes in stock for test rides, but call ahead to make sure they're ready for a test ride. Note that you can test ride bikes at this location, but they are currently not offering ebike purchases from the Vancouver retail store. All ebike purchases must be made online. Reckless has two locations, but the Davie Street location has Babboe & Urban Arrow on the floor. Andrea opened Sidesaddle specifically as a women-friendly shop. They have at least one Haul A Day & a Spicy Curry available for test rides. I posted about the shop not long after they opened. Velo Star carries the widest variety of brands of cargobike... but the small shop doesn't have room for floor models. Owner Clint's personal CETMA is available for test rides most days--call ahead to be sure it's at the shop. Here's a short review I wrote after borrowing Clint's CETMA for an afternoon. Pro tip: this is where we go for service on all our bikes--the mechanics here really know & love cargo bikes. UPDATE: (January 2019) Tandem Bike Cafe has been renamed & is currently undergoing renovations but is still doing bike repair & sales. That about wraps up my updates to the list. Please let me know if you know of other cargo bike selling shops in the city that I've missed! Disclaimer: I was not compensated in any way to list these bike shops & have no affiliation with them, other than being friends with Clint from Tandem. The above information is correct as of the writing of this post & opinions above are my own, as always. Not in Vancouver but they do ship, our local bike shop in Calgary (http://bikebike.ca/) started a webshop this year: https://bikebike-inc.myshopify.com/collections/cargo-bikes. hi, seems like tandem has closed. do you know of any other local connections for Bullitt bike? thanks. Sorry, I missed this comment! Tandem has been renamed (Velo Star Cafe) & they are renovating--they're still doing business though! You can contact them at the same number, 604-376-8223.